Immerse yourself in Sydney’s true lifestyle – our guide to Sydney’s best in outdoor activities, natural beauty, and local cafes. Sydney locals take time to step outside of their office buildings and see the beauty of nature around them; they are constantly active, fit and healthy. You can also enjoy the outdoors during your stay here – keep reading for a few tips on enjoying all that Sydney has to offer. It is a bike-friendly city, so travel around on two wheels as you explore the distinct neighbourhoods and areas. Locals love to enjoy the warm weather and fresh air in Sydney and many run along the streets or by the beach to stay fit. Follow the Iron Cove shoreline for a refreshing run along the water’s edge, popular for runners, bikers, and dog walkers. In the heart of the bustling central business district, or CBD, is the famous Hyde Park, the oldest public parkland in Australia. Walk or bike along the tree-lined streets of the park and along to Archibald Fountain, the perfect place to become enchanted by the bronze figures and have a coffee while you sit and enjoy the weather. Cafe Ella is charming cafe popular among university students; it is situated right along the transit line and is a great place for a filling snack. Only a twenty minute walk from Hyde Park is Farm Cove. The area surrounding the cove is enchanting – visit the Royal Botanical Gardens or the Fernery before stopping along the shore. With a view of the Sydney Opera House, it is the perfect place to stop for lunch. Speaking of, the Sydney Opera House is probably the most recognizable bit of architecture in Australia. Performances are always on the go, so check the listings for when you are in the city. The entire interior of the building is an experience for your senses and features massive windows looking right out into the harbour. Bondi Beach is always a popular spot for beachgoers from surfers, swimmers and sunbathers. But, this area is also home to an outdoor yoga class. No reservation needed, just drop by for Yoga by the Sea and breathe in the ocean air while you enjoy your practice. 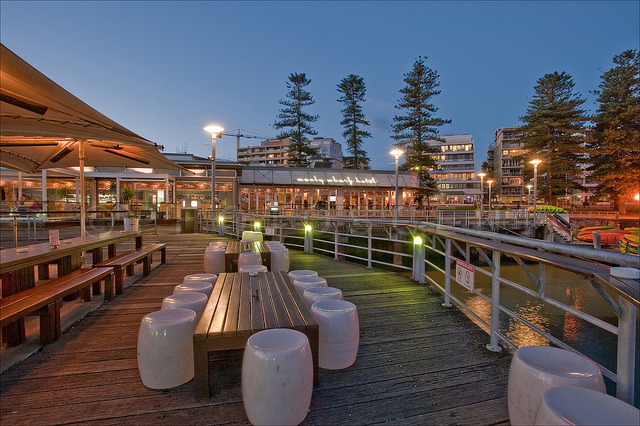 Get away from the city and visit seaside Manly for a different and exciting outdoor experience. Take the ferry over at an affordable price, and you’ll disembark in a different world – secluded coves, boardwalks, and beach life only a short distance from Sydney. Manly is the perfect location to have some fun, try your hand at parasailing, catch a wave with surfing lessons, then satiate your appetite with fish and chips right on the beach. However you decide to stay active in Sydney, you’re sure to see locals doing the same. So take a second and strike up a conversation, you may just find the hidden surfing spot, or the small cafe loved only by the locals. Editors note: it is law when riding bicycles in Australia to wear a legal bike helmet. Australia practices preventative health care and helmets help prevent serious injuries. A fine applies to non-compliance.